Fried rice is a popular dish throughout Asia. Traditionally, it has eggs, vegetables, and meat, and you can serve it as a main dish or a side. Since it has become popular in the west, people have created many variations of the dish. Our fried rice recipe has tasty shrimp with spinach and other wonderful flavors. If you’re looking for a delicious dish that comes together easily, be sure to try out this recipe soon! Fried rice tastes and looks amazing, making it great for a casual dinner at home with your family or as a main or side at a dinner party or potluck. Once you make this dish, you’ll be sure to make it again by request or need to give out the recipe. 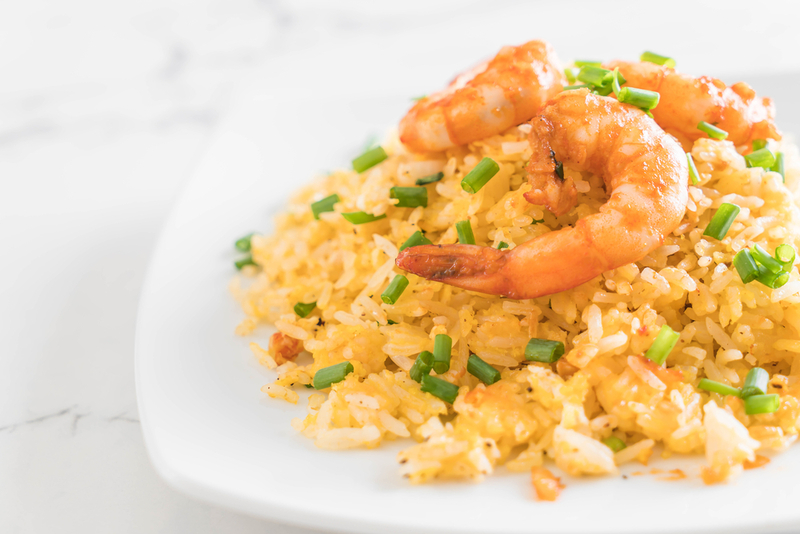 To make this shrimp fried rice with eggs recipe, follow our simple directions below! Bring 3 cups of water seasoned with some salt to a boil in a saucepan. Add the rice and stir once to break up any clumps. Cover the pot and reduce the temperature to low. Cook the rice for 20 to 25 minutes or until all of the water has been absorbed. To make sure the rice cooks properly, do not remove the lid while it’s cooking. Once the rice is done, remove it from the heat and set it aside. Heat the sesame oil in a wok or a large skillet. Saute the garlic until lightly browned and fragrant, about five minutes. Cook the shrimp evenly on both sides until pink, about two minutes. Add the spinach and saute until wilted, about two minutes. Remove the garlic, spinach, and shrimp from the heat and set it aside. Add the wine, baby bok choy and mushrooms to the same skillet. Heat over medium and stir for about three minutes. Add the rice, green onion and spinach. Stir until evenly combined. In a small bowl, whisk the eggs and the milk. Season with salt and black pepper. Create a small space in the middle of the wok or skillet. Pour in the eggs and saute until set but not dried out. When the eggs are done, stir until evenly incorporated. Once the rice is heated through, add the soy sauce and saute until well combined. Add more soy sauce if desired. Spoon the rice into four bowls. Serve. When you use high-quality and fresh ingredients, you can make a great recipe even better. Using Sauder’s eggs in this fried rice will give the dish great flavor. To find our eggs at the store nearest you, please use our store locator today!